A grassroots movement for economic democracy based on cooperatives and local economies is quickly growing throughout the planet. After Capitalism, inspired by P.R. Sarkar’s Progressive Utilization Theory, offers a compelling vision of an equitable, sustainable model which economically empowers individuals and communities. 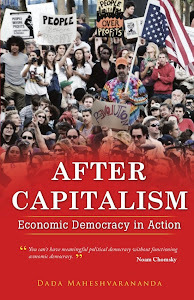 Filled with successful examples from six continents as well as many resources, activities and tools for activists,After Capitalism will fill you with hope and the conviction that a new, democratic economy is indeed possible. Includes a conversation with Noam Chomsky and contributions by Frei Betto, Johan Galtung, Leonardo Boff, Sohail Inayatullah, Marcos Arruda, Ravi Batra and others. . . 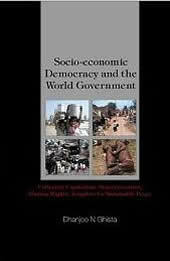 In developing an enlightened socio-economic-political environment, this book provides a new socio-economic-political system based on (i) Collective Capitalism (CCP) of cooperatively managed institutions and enterprises, and (ii) a Civilian Democracy (CDM) sans political parties, whereby the most qualified representatives of all the functional sectors of the community get elected to the local legislature. It also specifies a new economic-political structure in the form of autonomous functionally-sustainable communities (FSCs), within regional economic zones (REZs) and self-reliant regional unions (SRUs, such as the EU). This system of FSCs, REZs and SRUs will come under the aegis of (and collectively represented by) a World government, over-seeing the development of a comprehensive charter of human rights and social justice for all the people of the world. The neohumanistic integrated system of CCP and CDM, to be implemented within FSCs, will provide grass-roots socio-economic-political empowerment, contrary to the system of centralized economic and political governance. This book serves as a valuable teaching, learning, knowledge and research resource for (i) a holistic approach to a sustainable living environment promoting collective welfare, and (ii) a multi-stage road-map towards a world government system for unification of all the communities of the world into one global cooperative. The combined system of socio-economic democracy (involving knowledge and conscientious governance executives elected by and directly representing the various functional sectors of FSCs) and world government will help transform the current undignified north-south socioeconomic order into a democratic and equitable globalization order, for collective social security towards achieving sustainable local and global peace. A 260 page paperback has been published by Proutist Universal, Australia. Volume 1 contains four excellent essays on various aspects of Prout, written by two associates at Prout College. The Biospychology of Cooperation by Michael Towsey starts by reviewing the history of the cooperative movement then contrasts cooperation with capitalism and communism. The final part explores various aspects of cooperation, including the theory and science of cooperation, the concept of progress, egalitarianism, and the future of cooperation. The essay is essential reading for anyone who wants to understand cooperation from an ethical, social and cultural perspective. Education for Liberation by Marcus Bussey begins with the paradox of a modern education then introduces the philosophy of Neohumanism as the essential ingredient of an education for cooperation and liberation. Much of the essay focuses on the relationship between Prout and Neohumanism, exploring in particular the educational implications of the Five Fundamental Principles of Prout and the concept of sadvipra, the ideal for a Proutistic education. The Three-Tier Enterprise System by Michael Towsey introduces cooperatives from the traditional economic perspective and compares them with the more usual private and public enterprises. The essay then moves on to expand our understanding of the cooperative sector and to explore the governance and regulatory issues that are likely to arise in a cooperative economy. The essay provides new insight into how best to structure the enterprise system in a modern economy. Water and Land Management by Michael Towsey argues that a cooperative global society cannot be achieved without due attention to the local economy and the local economy depends first and foremost on water and land management. Whereas 20th century water policy focused on hydraulic engineering, so the 21st century approach will be about ecosystem management and biotechnology. The essay clearly sets out the fundamentals necessary for localised planning. 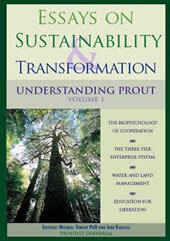 The book first appeared in electronic format in 2009 to commemorate the 50th anniversary of Prout. ORDERING: The book is distributed by the Prout Institute of Australia (PIA) and can be ordered through the PIA website http://pia.org.au. For sales enquiries and payment via Paypal, email: <admin@pia.org.au>.